In December 2016 Socfin published its ambitious Responsible Management Policy, committing to implement responsible land development and improve lives in its operations and along its supply chain. This space is where the Socfin Group communicates about its commitments, reports on its progress and allows stakeholders to express their concerns. 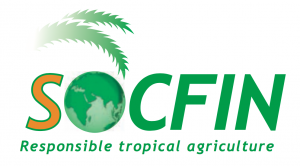 The Socfin Group specialises in the development and management of oil palm and rubber tree plantations. To-date, the Socfin Group is present in 8 Central African countries and 2 countries in Southeast Asia, managing a total of 15 agro-industrial projects. The Socfin Group’s strength is based on its expertise and the integrated nature of its activities, but also on its knowledge of the sector and its adaptability to current social issues. In January 2017 Socfin entered a partnership with TFT to support the implementation of its Responsible Management Policy, which was published in December 2016. Together, Socfin and TFT are collaborating to find practical solutions to the sustainability challenges in our operations. TFT also assists us in capacity building of our sustainability team, field visits, stakeholder engagement and public reporting. As a TFT member, Socfin sees TFT as a partner with whom we are exploring ways of bringing meaningful and pragmatic solutions to achieve sustainability in agro-industry. Socfin Transparency DashboardAll content © 2015 - 2019 Socfin. Site provided & verified by TFT. Platform created by Rareloop.